We think it is a great feat of engineering to celebrate about! Love it or hate it, here are some bits of information you may not have known, while trundling around in a packed carriage! The London Underground, or the Tube, was the world's first underground railway in the world. 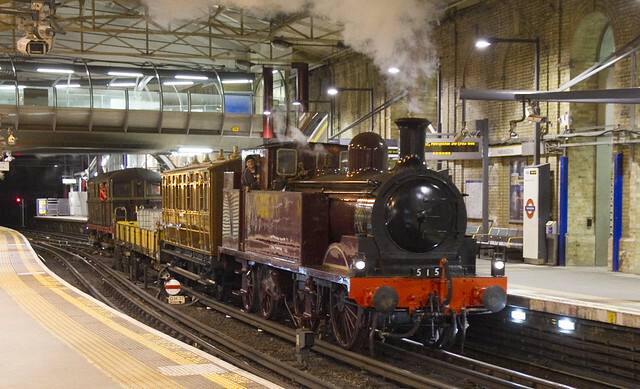 It opened in 1863 when its very first journey took place on the 9th of January between Paddington and Farringdon using the Metropolitan Railway. The general public was admitted the following day. The early lines were built using the "cut and cover" method: basically hollowing out a trench, laying the train tracks, and then covering over it with a road. While this method was quick and effective, it was also quite disruptive to traffic and only allowed relatively shallow tunnels to be built. By the beginning of the 20th century, deep-level tunnelling methods meant new lines could be built with minimal disruption to the surface and the network expanded rapidly, with 40 new stations opening between 1906 and 1907. The London Underground was also the first system in the world to use electric trains, which were launched on what is now the Northern line in 1890. However, on some parts of the network, steam passenger trains continued to be used up until 1961. A very familiar tool for getting around the Tube is Harry Beck's famous, non-geographical Tube map which was first issued in 1933. Although very misleading for visitors and many locals, it’s now regarded as a design classic. Today's Tube map is an updated version of Beck's original. During WWII, the London Underground played a role in the Blitz with many stations used as air raid shelters and for makeshift accommodation. The newest Tube lines to be built are the Victoria Line, which took about 20 years to complete and opened in stages from 1968 to 1971. And the Jubilee Line, which opened in 1979. London's Tube is a huge network with 3 million passenger journeys made per day from 275 stations, on more than 408km of railway track. An average 2.7 million tube journeys are made on the tube each and every day. With a statistic like that, you’d think many people might have inadvertently given birth while travelling on the tube. Yet only three babies have ever been born in the London Underground. The first (a girl) was in 1924, the second (also a girl) on the 19th of December 2008 and the third, the first boy to be born in the Underground, in May 2009. Early in 1987 smoking in the stations and trains was banned for a six-month trial period and then permanently after a discarded match started the King’s Cross fire in November 1987, killing 31 people. The deepest lift shaft is at Hampstead and 55.2m deep. The average scheduled train speed (including stops) is 33 km/h. The Animals of the Underground is an art project started by Paul Middlewick in 1988 after he spotted an elephant shape while staring at the tube map during his daily journey home from work. Created using the tube lines, stations and junctions of the London Underground map, the animal collection grows all the time and includes whales, birds and bats. The longest single journey on one train is the 54.5 kilometre trip between West Ruislip and Epping, on the Central Line. Each of the 400+ escalators does the equivalent of two round-the-world trips every week. A fragrance call Madeleine was introduced at St. James Park, Euston, and Piccadilly stations in 2001 as an idea to make the tube more pleasant. It was supposedly a fresh, floral scent, but it was discontinued within two days after numerous complaints from people saying they felt ill. In January 2005, the London Underground announced that it would play classical music at stations that had problems with loitering youths. A trial showed a 33% drop in abuse against tube staff. Wonder if it’s still happening? In 2004 it was found that rubber mountings on carriages were collapsing on Piccadilly Line carriages due to excessive passenger weight! (must be from all the shopping) The estimated cost of replacing these defective mountings is in excess of twenty million pounds. The iconic phrase MIND THE GAP originated on the Northern line in 1968. Filming takes place in many places in the Underground system, but the most common locations are Aldwych, a disused tube station which was formerly on the Piccadilly Line, as well as at the non-operational Jubilee Line complex in Charing Cross. One of the levels in Tomb Raider 3 is set in the disused Aldwych tube station and sees Lara Croft killing rats! In Harry Potter and the Philosopher’s Stone, the Headmaster at Hogwarts has a scar shaped just like the London Underground map on his knee. Christopher Lee and Donald Pleasance starred in a 1970′s horror called Death Line which tells the story of a cave-in while a station is being built atRussell Squarein the 1890s. Several labourers are presumed dead and the bodies are left there when the construction company goes bankrupt. People who commit suicide by throwing themselves under tubes are nicknamed “one-unders” by London Underground staff. It is estimated that around 100 tube suicides occur each year, the majority of these at Victoria and King’s Cross. The best places to spot the legendary underground mice running around the tracks are Waterloo Station and any platform at Oxford Circus. There are many reports of the London Underground being haunted. One of the most famous haunting stories is the story of Anne Naylor, murdered in 1758 and said to haunt Farringdon Station. Passengers have often reported hearing blood curdling screams as the last train leaves. If you think about it this way, the Tube was built 150 years ago using picks shovels and wheel barrows. They then devised other ways to remove the earth and create the tunnels. We transported in the first year over 11 million passengers through the tunnels. The workers and engineers were a clever hard working bunch and even though we complain its hot and choca block, they created a marvellous thing. What will the minds of today create I wonder! Underground sign thumbnail from FreeFoto.com.